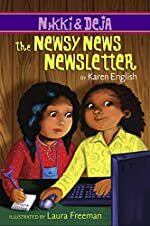 Review: 'The Fulton Street Newsy News Newsletter is Born (Officially)' Nikki & Deja: The Newsy News Newsletteris written by Karen English and illustrated by Laura Freeman. The main characters in the book are Nikki and Deja. The Newsy News Newsletter is the third book in the Nikki & Deja series. On Fulton Street, there is always something happening. Darnell, a fifth grade boy who lives on Fulton Street, shows Evan, another boy who lives on Fulton Street, how to do a skateboard trick. But, Evan breaks his arm. Nikki and Deja take note of this event. Then, Nikki thinks that it would be a good idea to make a newsletter for Fulton Street. She thinks that it would help her skills to become a reporter later in life, but mostly because there is so much news to tell. Nikki and Deja decide how to make it, how much they are going to charge and when they will sell the newsletter. Nikki spends the rest of the day trying to find news. She walks around and writes news down in her notebook, including overhearing other discussions and seeing things happen. The girls put the news on the computer and then print it all out. When they start selling it, everyone is buying it. But then Deja's aunt reads it and gets very upset. She tells them that they are putting wrong information in the Newsy News Newsletter. She makes them write one last issue that provides the right information for the ones they messed up. They still also have to give a face to face apology to the stores that they criticize. I like the book because it is very easy to understand. This is good, knowing that it was probably written for kids eight (8) and under. Girls will most likely enjoy this more than boys. I think that Nikki & Deja: The Newsy News Newsletterhas an abrupt ending. I would have liked to have a strong closing. The book does not have enough action for me, and I think that this book could have a more regular chapter length. In other words, some chapters could have been combined. I recommend this for kids age 8 and under and would rate it a 3 to 4 out of 5 for this younger age group. We would like to thank Houghton Mifflin Harcourt for providing a copy of Nikki and Deja: The Newsy News Newsletter for this review. Have you read Nikki and Deja: The Newsy News Newsletter? How would you rate it?